As Rolfers™ we’ve earned a reputation, or ten. We probably deserve at least two of them. I flatter myself to think I have deserved at least this: a true concern for (W)holism. not to mention the sacred synergy of a living being. So instead (if it is a good day) perhaps I set to work on her left ankle, which in neglecting to bend in response to the vicissitudes of the terrain, represents the silent instigator of the insurrection—the true progenitor of the whole catastrophe. The world flouts consistently our expectations of it. Things as they seem often conceal things as they are. But if one really considers it, what’s even more ironic than the sudden revelation of insidious compartmentalisation is this even felt like a surprise in the first place: subjectively, global connectivity & interdependence often appear to us like novel concepts. Nevertheless, from an objective viewpoint, unconditioned by reductionistic prejudices, such a conception couldn’t be more obvious. It’s ironic that it’s ironic; irony pouring in by the bucket-full. Learn to see. Realise that everything connects to everything else. The lines in marble are just constellations in a singular sky. By convention of thought & language, we divide the said heaven & the world below. We sunder, slice, & partition our experience, cleaving reality into innumerable separate units, which we then take to be discreet objects. We cut things up & then say “they was made of pieces.” And then we forget that we did it in the first place. Conflating convention with truth, we consequently ignore Da Vinci’s counsel. We neglect the unity behind all stipulated particulars. Where indeed does the ankle end & the leg begin? The hip, the trunk, the chest, the neck…? After all, it’s all one body. Where do I end, where does the world begin? Am I not a piece of this said world, quarantined only by verbal artifice, enchanted by the spell of language? 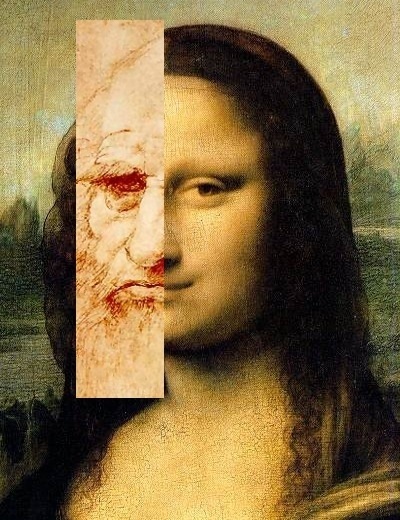 Neck & Ankle, Self & Other, Mind & Matter—when we learn to look with Da Vinci’s eyes, such antitheses dissolve. All chronic strain of mind & body, once concomitant with our efforts to sustain such grand illusion, naturally subsides as well with the dissolution of its cause. The stormclouds of conceptualisation fade. The boundless sky appears; always there but now revealed, immaculate, speckled with stars & constellations like the lines in marble.